Shown above is model U602, which is a VHF only receiver. The day of the valve was clearly numbered though, as this isn't a new design. It is simply the model U502 from 1959 in the same cabinet, but with a marginally restyled decorative metal plate and fittings to the front of the receiver. 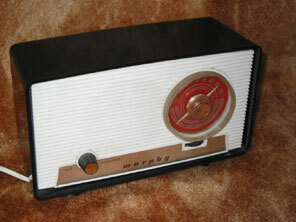 The receiver main body is black plastic, as opposed to sprayed bakelite seen in the 1959 model. It actually looks quite good, and of course doesn't suffer the problem of obvious scratching over time that so often spoils the appearance of sprayed cabinets. Valve line-up is 10L14, 10F18, 10F18, 10D2, 10PL12, U381. (Kindly donated by Mr P. Pearson).